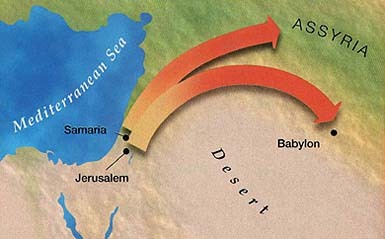 The Southern Kingdom of Judah, whose capital was Jerusalem, lasted for approximately 150 years longer than the Northern Kingdom of Israel (aka Samaria or Ephraim) before they, too, were finally sent into exile. YHWH did not divorce Judah, like He did Israel (Samaria). Every single King in the northern Kingdom of Israel was evil. In Judah, there were only a handful of “good kings” out of 20 bad kings during the entire time of the Divided Kingdom. 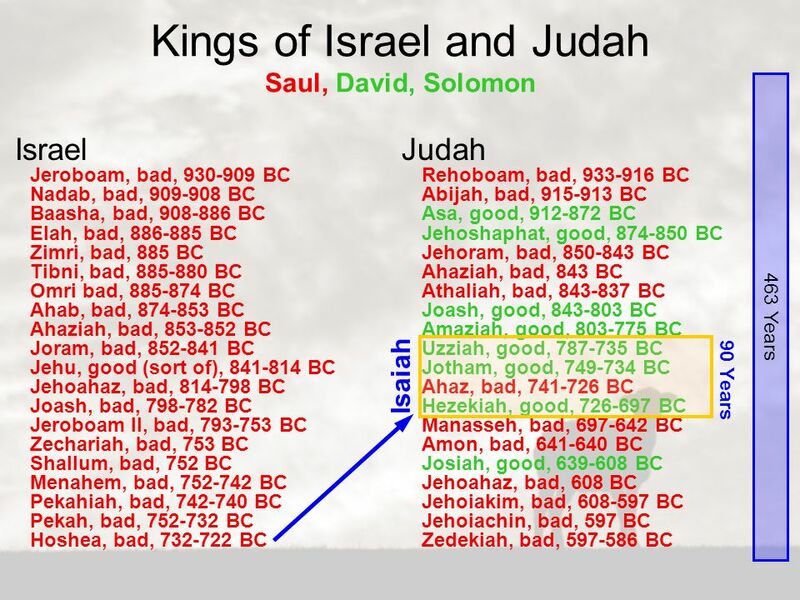 Judah’s Kings …Most of them EVIL, a few were “good”. King Hezekiah and King Josiah were the last two “good kings” of Judah. For the first time, the royal seal of King Hezekiah in the Bible was found in an archaeological excavation. The stamped clay seal, also known as a bulla, was discovered in the Ophel excavations led by Dr. Eilat Mazar at the foot of the southern wall of the Temple Mount in Jerusalem. Hezekiah restored the Temple, which had been left in disrepair by all of Judah’s previous “bad kings”, he restarted Passover celebrations in Jerusalem, and he was able to defeat the mighty Assyrian Army because God Himself provided the victory! This was really amazing because Assyria had brutally defeated the Northern Tribes of Israel and carried them off into Captivity (exile). The final “good King” of Judah was King Josiah. 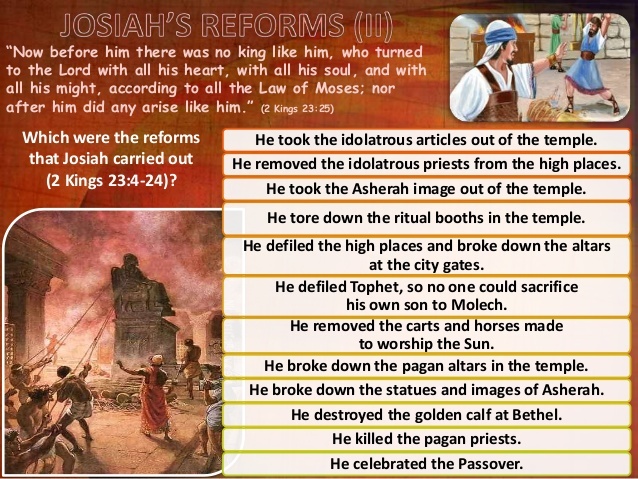 Josiah smashed all of the idols in Judah, he continued with the Passover Festivals that Hezekiah had started, and he even re-discovered new “books of the law” that had been written by Moses. In about 612 BC Babylon conquered Assyria to become the dominant super power. After Josiah, the 4 remaining kings of Judah were all EVIL, leading the country into idolatry. This finally brought about the destruction of Jerusalem and the Temple, and the exile of the people of Judah. Ezekiel 23 paints a very descriptive picture of Judah committing spiritual adultery (idolatry), even after witnessing her “sister” Samaria (Northern Tribes) being brutally conquered and taken exile into Assyria 150 years earlier. The Prophet Jeremiah had warned Judah for 40 years that Jerusalem would incur God’s wrath if she didn’t turn from her idolatry. Nobody listened, nobody changed. In 597 BC King Nebuchadnezzar besieged Jerusalem and took Judah’s King Jehoiachin prisoner, along with all the treasures of the House of the Lord (Temple) that had been made by King Solomon and also all of the “Mighty Men” (wealthy people), the craftsmen and the smiths. None remained except the poorest of the land (2 Kings 24:10-16). There were 3 Primary sieges of Jerusalem, before the city and Temple were burned to the ground. The first Siege of Jerusalem – the prophet Daniel was taken captive into Babylon along with all of the Nobles and the treasures that were in the Temple. The 2nd Siege and deportation of Jews to Babylon included the Prophet Ezekiel. At this time, the final “evil King” was ruling in Jerusalem, King Zedekiah. The 3rd siege occurred in the 11th year of King Zedekiah’s reign, the 19th year of Nebuchadnezzar’s reign. The city of Jerusalem fell in 586 BC, when Nebuchadnezzar burned down the house of the Lord (Temple), and the entire city including the walls that surrounded Jerusalem. Jeremiah had warned the people of Judah that they would be conquered by Babylon because of their idolatry. But unlike the Northern Kingdom, Judah’s exile would have an “expiration date”. The prophet Jeremiah was not taken captive; however, he did send the exiles in Babylon a letter explaining that the Lord had told him they would be in exile for 70 years. The Lord gave the people of Judah some instructions that they were to observe during their time in Babylon. Jeremiah 29:1: Now these are the words of the letter which Jeremiah the prophet sent from Jerusalem to the rest of the elders of the exile, the priests, the prophets and all the people whom Nebuchadnezzar had taken into exile from Jerusalem to Babylon. 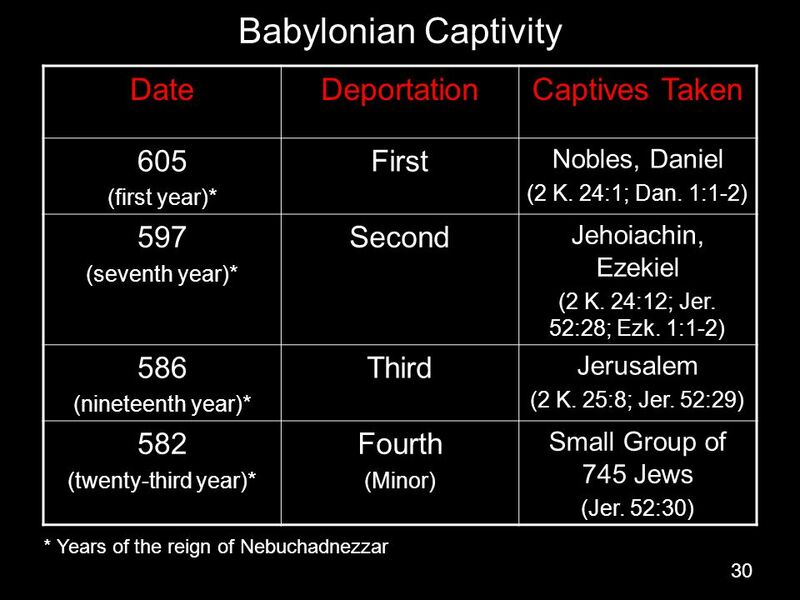 The exiles were to be in Babylon for 70 years. Seventy has a sacred meaning in the Bible that is made up of the factors of two perfect numbers, seven (representing perfection) and ten (representing completeness and God’s law). As such, it symbolizes perfect spiritual order carried out with all power. It can also represent a period of judgment. Jeremiah 29:10: “For thus says the Lord, ‘When seventy years have been completed for Babylon, I will visit you and fulfill My good word to you, to bring you back to this place. 11 For I know the plans that I have for you,’ declares the Lord, ‘plans for welfare and not for calamity to give you a future and a hope. God promised Judah that they would return to Jerusalem after they had served the King of Babylon for 70 years. During that time, they were to marry and increase, bless the land, find homes, plant gardens, and seek the welfare of Babylon. It was during the 70 years of exile that the Torah was written in the form we see today, that the religion became known as Judaism and the people became known as Jews. Because there was no Temple, the Jewish people created synagogues, or Jewish houses of worship. This 70 years of exile, known as the diaspora, is also a “picture” of the exile that mankind finds itself in today from the Garden of Eden. The number 70 carries with it perfection and completion. During our exile, we are to build homes, increase, plant, and bless the land in which we live. Like Judah’s exile had an expiration date, our exile into Spiritual Babylon also has an expiration date. However, we also have a choice. We are in exile from the Garden of Eden. The two exiles of Samaria and Judea remind me of our choice to turn back to God, or not, to choose His Son Jesus, or not. Samaria, as a whole, refused to turn back to YHWH and were exiled permanently, divorced from God and no longer covered by the Old Covenant, the Covenant of the Law. During the Diaspora, or exile in Babylon, Judah tried to worship YHWH in Synagogues, and although they still really didn’t get it right, they made an effort. YHWH did not divorce them, and they were permitted to return to Jerusalem after 70 years. Still, there is hope for individuals from the Northern Kingdom because although they no longer exist as a people group, God has a remnant that is being saved through the New Covenant, the same as the Gentiles (non-Jews). Eventually, a remnant from Judah will also receive the New Covenant when she finally recognizes her Messiah Jesus. Jesus is the only path to salvation for Jew or Gentile!